After $32 million and an eighteen year endeavor, L'Hermione departed from Rochefort, France on April 18, 2015. The Marquis de Lafayette's mottos, "Why Not?" and "Anything is Possible", have come to fruition once again with the help of artisans from all over the world, thus bridging the gap between the eighteenth and twenty-first centuries. The nineteen year old French aristocrat, who volunteered to serve with General George Washington, played a vital role in the American Revolutionary War. When Lafayette returned to America aboard L'Hermione in April 1780, he brought fresh hope with the welcome news that King Louis XVI had agreed to send a French Expeditionary Force of 6,000 elite troops, artillery pieces, munitions, ships and money. It was a key turning point during America's war against the British. 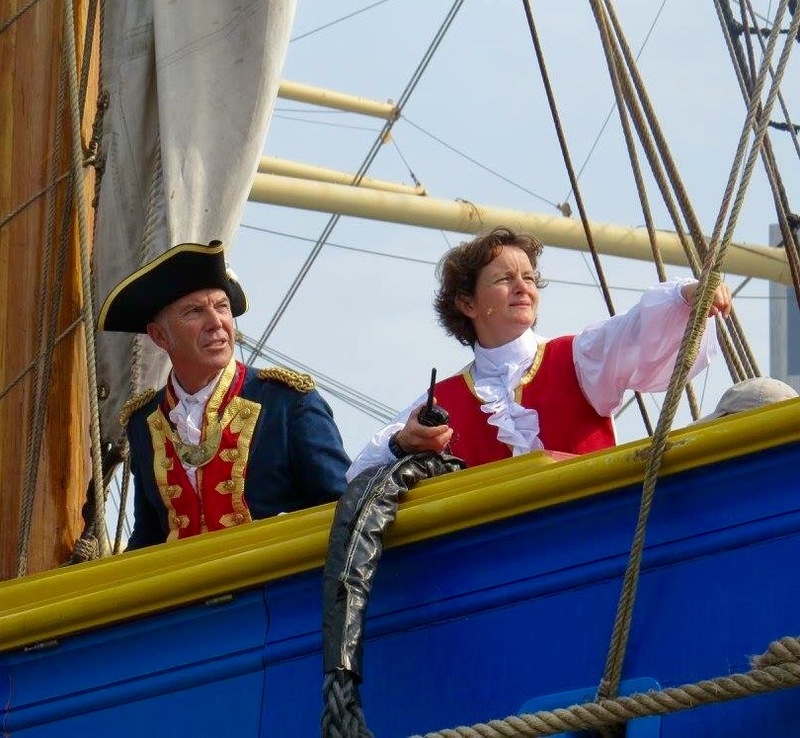 Captain Yann Cariou and Chief Mate Charlene Gicquel of L'Hermione. In order for the exact replica of L'Hermione to be deemed seaworthy in the twenty-first century, the Coast Guard required only three changes: an engine, latrines and women. Captain Yann Cariou and Chief Mate Charlene Gicquel lead the crew of 74 of which one third are women. Adam Hodges-LeClair plays a distinguished, confident Marquis Lafayette, who takes his role seriously. 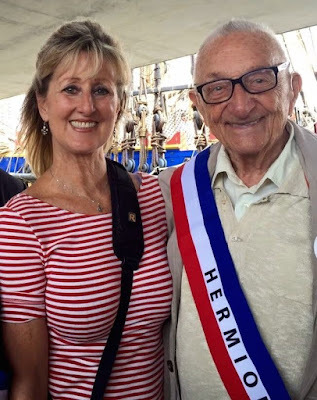 Young students from French lycées, sponsors, journalists, musicians, tourists and L'Hermione enthusiasts arrived in New York City on the first of July. While observing the docking process and mingling aboard the frigate, I witnessed brawn, team work, exuberance and a zest for adventure. After sailing for more than two months, the crew met us with fresh smiling faces and an eagerness to share this vital oral history. 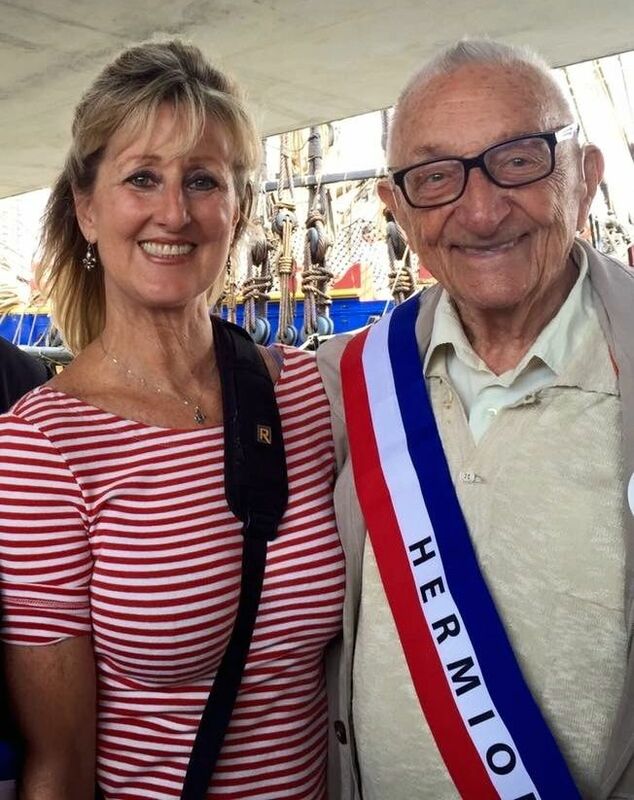 I had a special interest in one of the guests, 93 year old Robert Boulitrop, from Charleville Mezieres, France. After observing that I was photographing him (appreciating his French characteristics) we began talking and I teasingly asked if I could join him for the ceremony! He responded, "Oui, if you will marry me!!". We are email friends now and what a treasured memory I have. As part of the Heritage Village, some of the other events included a quay side outdoor museum of the history of the original frigate and the back story of the replica. Storytelling, musicians, reenactments, daily deck tours and a private evening on board provided additional entertainment. On Friday, July 3, the Lower Manhattan Historical Society sponsored the first Fourth of July parade in forty years. It went from Wall Street, where George Washington was sworn in as America's first president at Federal Hall, to Bowling Green. Guest speakers shared historical events, of which Lafayette played a vital role, including the raising of the first flag with the original thirteen colonies in the exact spot where we congregated. What made this ceremony so special was that both the French and American flags were raised while their respective national anthems were played. Saturday, spectators gathered to watch the Parade of Ships showcasing L'Hermione as she was surrounded by a hundred ships sailing from the Verrazano Bridge area to the USS Intrepid. At this point, L'Hermione turned and headed to Govenors Island, docking for the last time for a private event and Macy's Fireworks! The French frigate set sail for its next destination later that night. Taking the ferry to Govenors Island after the flotilla, I wanted to gaze one last time at this magnificent ship; so appreciative was I of the opportunity to witness history in the making. As the ferry pulled away headed for Brooklyn, a French mother and her toddler called out many times, "Au revoir bateau!" ("Goodbye boat"). As many have said, Lady Liberty was the second gift France gave to America. L'Hermione and Lafayette were the first. Well-planned events throughout the French frigate's four-day stay would not have been possible without the support of Moët Hennessy, the Grand Sponsor; Tall Ships of America, Founding Maritime Partner; Poitou Charentes Region of France; the French Embassy and the New York Parks and Recreation Association. 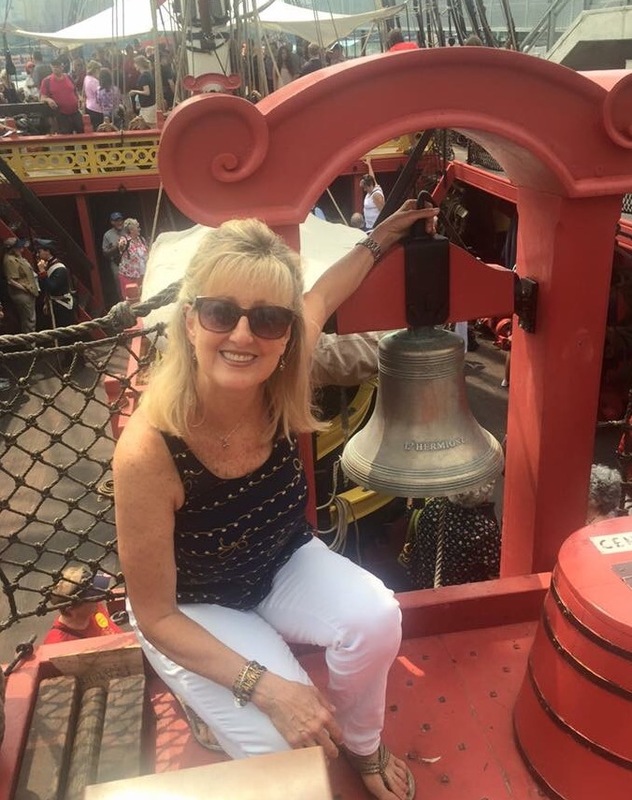 Cissy Paul: Cajun, wife, retired Elementary Education teacher, mother & grandmother. Lover of geology, bridges, photography, architecture, history, fashion, reading/research, parks and the arts. Enjoys daily serendipitous moments whilst exploring on holiday or NYC's five boroughs. Member of the Central Park Conservancy Horticulture Volunteers (gardener) and the NY Walker's Club (Saturday Race-walking at Central Park). Follow Cissy's exploits on Facebook: Cissy Paul, Instagram: passionfornyc and Twitter: @cissypaul.